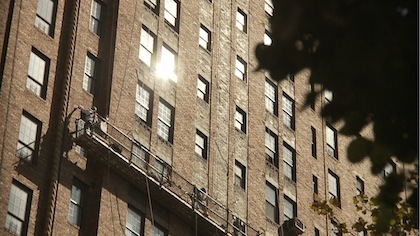 Over eight minutes that feel longer, and not in a bad way, we look at beautifully, carefully, gently, recorded facades of NY buildings: the fronts of places where many marvelous gay men lived when they died of AIDS. Some move; some sit very still; all remind me that buildings, and streets, and passers-by, know and remember nothing of these lives, or times, or people lost. Why should they? New York City, in particular, for me, is brutal. A hard case to crack. A mean shell. The streets where Jim and I ambled and cartwheeled. The buildings to which we thought we had found the key. Until he died, young and suffering. New York (and I) went on. And yet, Sachs’ New York is all gentleness and lilting color. Warm and evocative, a place to slowly meander and remember and mark. Both are NY. Buildings of bricks and the people they housed who were and are.